Since 2011, Mike Schartiger, Mike Ternosky, Justin Redlinger and Jon Kogut have delivered feel-good grooves to the Akron area, playing a blend of funk, jazz and reggae that perfectly complements any outdoor summer happening. The band’s mission is to make the world a better place, “one note at a time,” and while such a goal may seem broad and idealistic, hearing their smooth, melodic jams can at least put the listener in a much more positive, united headspace. These guys have a noticeable Sublime vibe with all the attributes and sensibilities local Deadheads will dig. Tunes like “Paradise,” “Someday,” “Live For Tomorrow” and “Cloud 9” communicate the group’s message of hope and peace, accented by staccato chords signature to the reggae style. As is tradition in reggae music, the group crafts songs with a somewhat political message, sharing their words of wisdom about a brighter future. StepS2Change recently performed with blues rockers Outdated View at Barley House downtown and will make their rounds across the Northeast Ohio region as their sound and catalog expand. Women have made an incredible impact in reggae music, but too often their contributions to the genre are overlooked or forgotten. As a response, Akron’s own Umojah Nation banded together to celebrate collaboration between men and women musicians, placing husband-and-wife powerhouse Tracey and Stefano Nguma at the forefront of the group. Its name comes from the Swahili word for “unity,” which is quite appropriate, as this eight-piece ensemble works seamlessly together, delivering both original tunes and covers of revered reggae artists like Bob Marley and Freddie McGregor. Umojah Nation has shared the stage with Carlos Jones and the PLUS Band, Mighty Diamond and Dub is a Weapon, just to name a few. As Akron’s most distinct and harmonious reggae group, it’s not hard to find the musicians performing around town at Mustard Seed, Hardesty Park, Musica and nearly any other venue that can contain their powerful, vivacious sound and energy. Head north for an hour and change, and you’ll reach the city of Norwalk, home of spacey rockers Violet Blue. Though they may be rooted in Ohio, their music sends the listener straight through earth’s atmosphere and nestled high up into the stars and galaxies. With layered vocals and distorted guitars, the quartet delivers a lush, textured sound that’s both dreamy and disorienting. “Dazed” could be considered the perfect introduction to the group, serving as a compelling original tune packed with fervid vocals, animalistic drumming and the band’s signature dense and otherworldly guitars. The band released its first, self-titled EP this year, available at violetblueoh.bandcamp.com. An inspired fusion of shoegaze, punk and alternative rock, Violet Blue is igniting venues across the state with their loud and vibrant live performances. 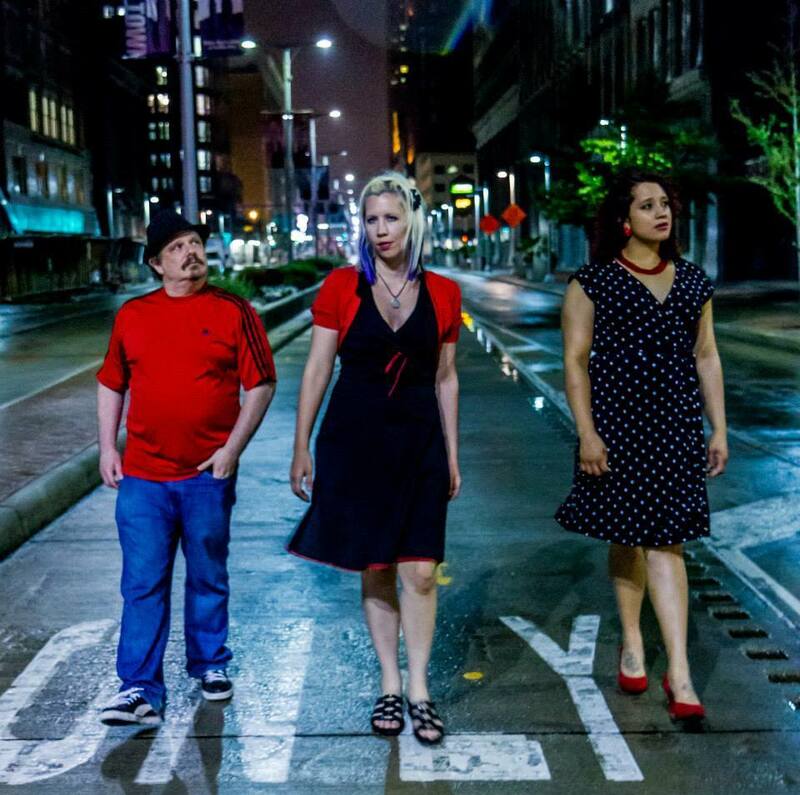 Cleveland punk band The Village Bicycle released their second album back in February. “Fits and Starts,” which is available on the group’s Bandcamp page, balances classic punk posturing with something smarter and deeper. When she sings “Hot Mom,” vocalist Elizabeth Kelly has her tongue firmly planted in her cheek: “She’s a woman of the nineties, she knows what she’s about. / She watches Nancy Grace while she’s working out.” But these punks can be profound, too, as in “Interstellar,” the album’s first track: “The metal in our bodies comes from outer space / … / And when we die, someone will take our place / And we’ll become the minerals beneath their feet.” High and low can both find a home within the noise and the rhythm of The Village Bicycle. 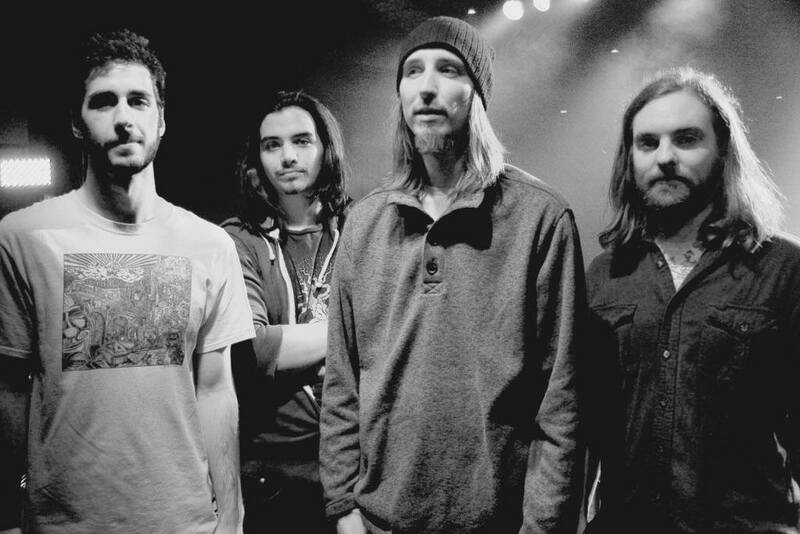 Fusion prog-rock band Treespeak is a newcomer to the Northeast Ohio music scene. Composed of Andy Russo on drums, Doug Gallo on bass, Elias Bolick on guitar and David Boehm on the keyboard, the group finds its groove and sticks with it, trading funky improvised melodies. 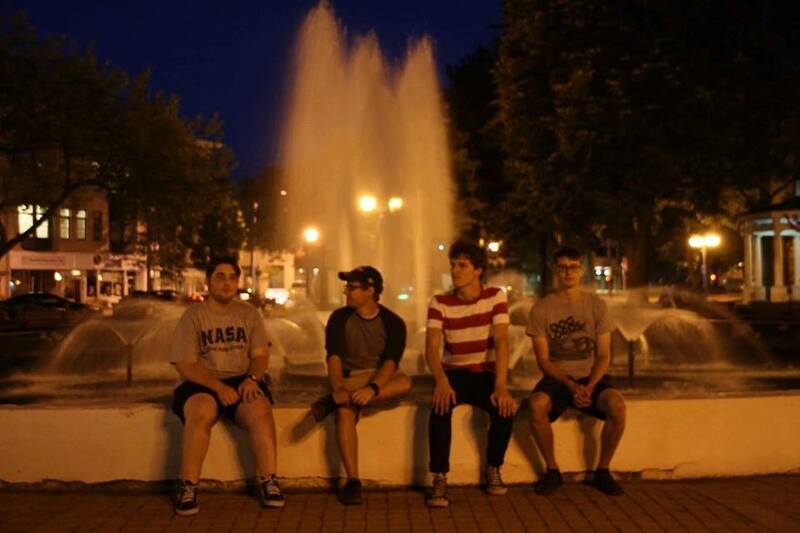 Since forming in late January, Treespeak has played shows throughout the region. On Aug. 7, they will perform at Cin Dee’s Place in Medina. Get a taste of their sound on their Bandcamp page: treespeaktunes.bandcamp.com. Don’t bother trying to pin down Kiss Me Deadly. With their eclectic mix of classic rock instrumentation and offbeat touches – such as bouzouki electric mandolin – it’s easiest to just call them an indie rock band and call it a day. After eight years of performing throughout Cleveland (with the occasional visit to Akron), they’ve also earned the right to be called old pros. Their quirky style – and even quirkier sense of humor – is on full display in their music videos, which feature off-the-wall visuals like campy secret agent karate fights and a man in a chicken suit. 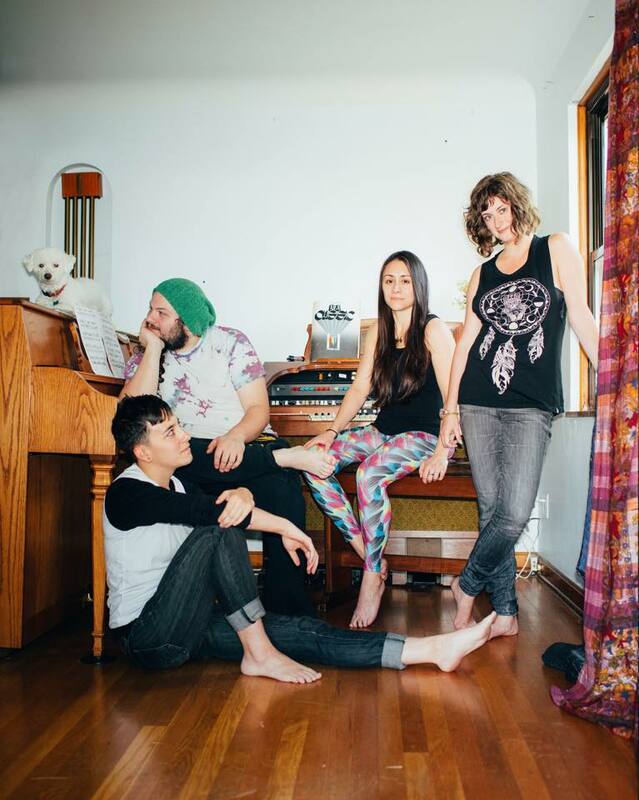 Their sound is infectious too, with influences from blues rock to folk to punk. Their debut album, “What You Do In the Dark,” released last year, is available on iTunes.